Description: Northbound manifest approaching CP South Saginaw on the BNSF Fort Worth Sub. Description: Part of west bound BNSF train along the Columbia River. Description: The SPOLVJ arrvies Kalama to do some work before heading to Longview Jct. Description: The SPOLVJ made a quick turn at Longview Jct and is seen heading back to Spokane as the LVJSPO. 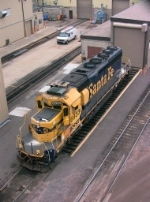 Description: Here's a nice treat for you, a former Sante Fe SD40-2 in the diesel shops. This unit came in the day before, and I thought I'd missed my chance. However, I got lucky and the unit was in a good place to fire off this shot. Description: Nice Bluebonnet sits in the yard. Description: Not many of these around so its always cool to see one. Description: A ex-Santa Fe classic suns itself Saturday morning - BNSF North Local power. Description: Thanks to a tip, and being out running errands, I was able to catch this rare lashup of two former Santa Fe SD40-2s rolling into Northtown Yard. Description: Two bluebonnet SD40-2's on a cross country freight(H-GALSUP) in 2010? NEAT!! Description: Theres a good chance that this will be my last shot of an un-renumbered BNSF SD40-2 on a mainline train. Description: Some nice power for the north/west local sits in the yard. Description: This paintjob never gets old in my mind. Description: I see some fool and spray can found the BNSF #6933 - what a shame. Description: I not sure where the 6903 came from but this was the only time I saw it.